Canned pumpkin is something of a commodity for canadian and american expats living in continental europe. Rumors regarding sightings in local grocery stores abound, but I for one have yet to see it in a single store anywhere in Frankfurt. Most of the big grocery stores here have a tiny section dedicated to english speaking expats, meaning that my peanut butter is sold alongside jars of marmite and vegemite. I must admit that this section of the grocery store fascinates and confuses me. The “american” goods one can consistently find include peanut butter, Fluff (in two flavors no less), maple syrup, Pop Tarts, Cheez Whiz, Mac-n-Cheese, and some boxed cake & brownie mixes. Now, while some of these products are useful, others are items which I can’t imagine ever missing. But before anyone accuses me of food snobbery, let me clarify that my biggest problem with this section of the store is not with what they DO stock, but rather with what they DO NOT stock. Things like brown sugar, double-acting baking powder, pecans, chocolate chips, vanilla extract, graham crackers, good cheddar cheese, and yes, canned pumpkin! And yes, I know that there are work-arounds for most of these, but honestly, if we can find room on the shelf for cheez whiz, why not canned pumpkin? Phew, sorry about that. This is one of those topics which can really get me going. I’ll wrap up by saying that if you ever find yourself living on this side of the pond (excluding the United Kingdom since they seem to use many of the same baking ingredients as the americans) the internet will become your best friend. So why did I start this post again? Ah yes, Pumpkin Gorgonzola Flan, a previously completed French Fridays with Dorie recipe which I am just now catching up with. 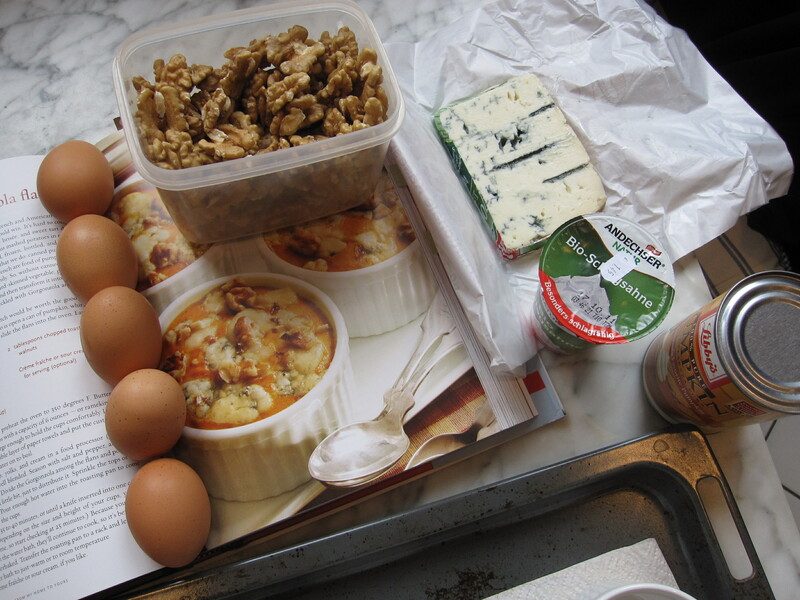 I have been looking forward to this recipe since my copy of Dorie’s book arrived in the mail. 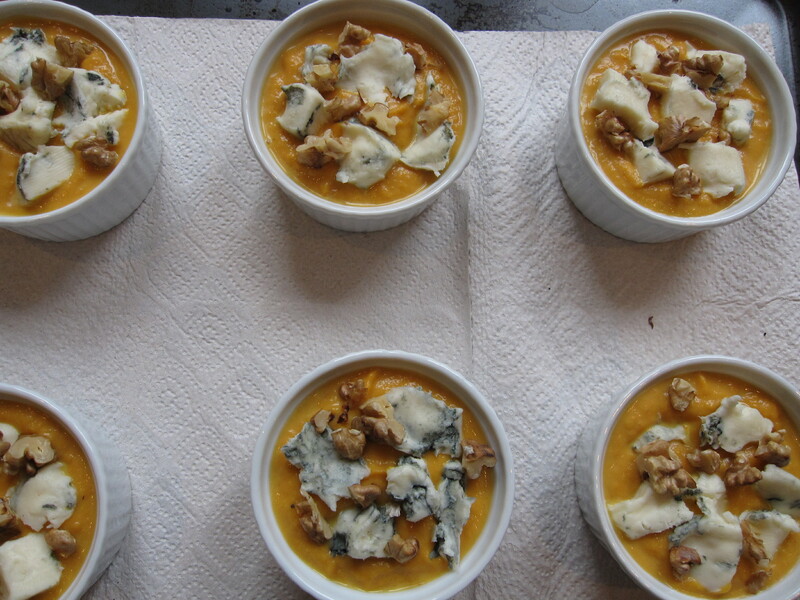 Pumpkin, blue cheese, and walnuts… yum, I was in love before these tasty little flans even made it out of the oven. The end result was creamy and delicious. I served it with a side salad, but this would have made a great side dish as well. Now for the all important question, would I make these again? Was it worth using up a can of my hard searched for pumpkin (because I am apparently far too lazy a cook to bother making pureed pumpkin from scratch)? This entry was posted in french fridays with dorie, life in germany and tagged Around my French Table, expat life, seasonal - autumn, side dish, vegetarian. Bookmark the permalink. So glad these met your expectations, given the run-around to procure the pumpkin! Mine came out gross, but it was one of those dishes where I feel like perhaps the end product I wound up with was not the same as how Dorie’s turns out when she makes it. Mine just didn’t have much flavor. You might be lucky, I hear that the grocery stores on the army bases are loaded with goodies, but as a civilian I have never been allowed to check this option out for myself. I understand that in the old days US citizens could shop on the bases, but no more. To be honest, I don’t know how expensive it is to ship between Italy & Germany, never tried it. But thanks for the offer. If I find myself short of pumpkin this Thanksgiving I might be sending you frantic pleas! How funny, I just mentioned the FFwD pumpkin gorgonzola to a friend not an hour ago when they recommended some gorgonzola cheese crackers to me…we did not care for these flans at all most probably because we are used to the Mexican sweet version of flan, but also because we are not used to eating gorgonzola and so the flavor combination was just so odd to us. They were beautiful though and so are yours! I am glad that they were worth the hunting down of ingredients. That must be so very frustrating. Lovely job! Your flans turned out great! Glad you liked them; they weren’t such a favorite here. Your flans look so lovely! I’m really glad you enjoyed them, especially after using your coveted pumpkin. Sorry to say these were not a favorite in my house either! I noticed that these got quite mixed reviews when they were the assigned recipe. I think the combination of ingredients is definitely tricky and I’m not sure I would ever dare serve these to guests, but we really liked them. Um, okay, I have been looking at these in the book, and wishing I was in the group when they were baked, but now I am just going to go for it. 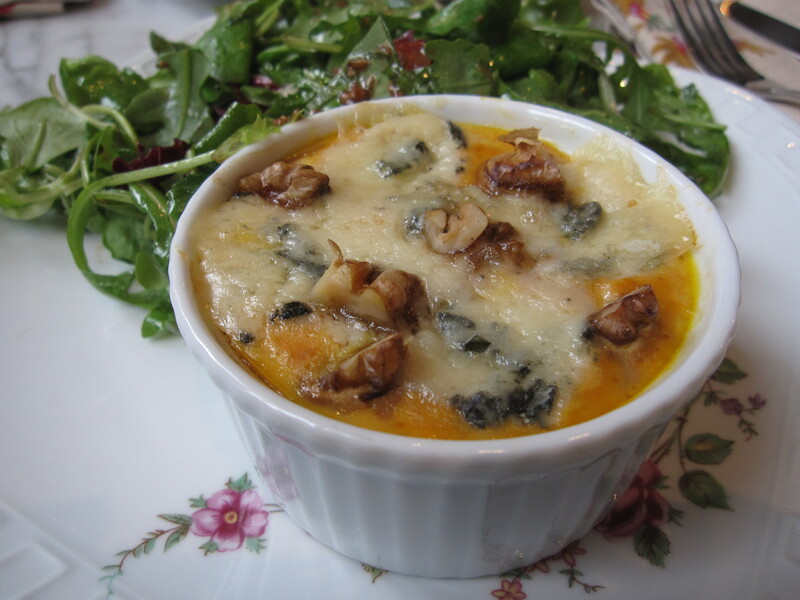 I don’t have to search high and low for pumpkin, so all I need is some gorgonzola — easy! They look spectacular, and this post inspires me to give them a try.